North Korea has begun installing a rocket at its Sohae launch pad ahead of a planned launch this month, South Korea's Yonhap news agency reports. The North's state news media say the launch is an attempt to put an observation satellite into space, between 10 and 22 December. It is expected to take scientists several days to assemble the three-stage rocket at the Sohae station. The US and its allies say it is a cover for long-range missile technology. Ambassadors from China, the US, Russia and Japan met South Korean officials in Seoul on Monday to discuss the situation. Korean Air is planning to reroute flights over the Yellow Sea to avoid possible collisions with rocket debris, according to the Associated Press. The airline could not be reached for comment. 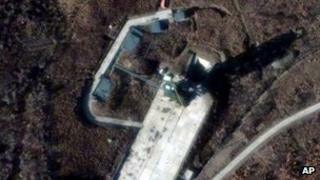 North Korea announced plans to a launch the rocket despite concern expressed by its main ally, China. In a statement on Sunday, a Chinese foreign ministry spokesman said the country hoped that "all relevant parties will do that which benefits peace and stability on the Korean Peninsula" and that "all sides will respond calmly and avoid exacerbating the situation". China acknowledged North Korea's right to the peaceful use of outer space, but said it should abide by a UN ban on ballistic missile tests. Yonhap quoted an unnamed South Korean government source as saying: "North Korea installed the first-stage rocket onto the launch pad. That means North Korea is starting its process of launching a long-range missile." The agency added: "It will take three or four days for North Korea to erect all three stages of the long-range rocket, South Korean intelligence and military officials say." The BBC's Lucy Williamson, in Seoul, says North Korea's state media have described the rocket launch as being for peaceful purposes, with the aim of putting a polar-orbiting earth observation satellite into space. But Japan has begun deploying a surface-to-air missile defence system to the southern island of Okinawa and is putting its armed forces on stand-by in response to the plan, officials confirmed on Monday. Russia, too, has warned that the rocket launch would violate UN Security Council restrictions which prevent the country from conducting missile or nuclear-related activities. "We urgently appeal to the government [of North Korea] to reconsider the decision to launch a rocket," Russia's foreign ministry said in a statement, according to Reuters. A senior government source said the Russian military was ready to intercept the rocket if it deviated from its trajectory, Russian state media reports. Meanwhile the Philippines said the launch violated UN resolutions barring from testing ballistic missile technology. The test will be the second to take place under the leadership of Kim Jong-un, who took over the leadership of the country after the death of his father Kim Jong-il almost a year ago. South Korea is preparing for a presidential election scheduled for 19 December. North Korea has notified its neighbours of the planned flight path, telling them it will follow a similar route to that of the most recent rocket launch, in April, which failed. The rocket, of the same Unha-3 variety, was supposed to pass over seas between China and the Korean Peninsula where the first stage of the rocket would fall into the sea, then to move over Okinawa. The second stage was due to fall in seas off the coast of the Philippines. "Unha" is Korean for "galaxy", and is the name given by North Korea to the space launcher version of its Taepodong-2 missile, which has an estimated range of 2,200km (1,300 miles). The missile has not yet been successfully tested.